Paneer Butter Masala is a very popular Indian dish renowned all over the world, for its rich and smooth gravy and delicious flavorful spices. All Paneer dishes are popular among all vegetarians, as it is a common source of protein and calcium. Palak Paneer, Paneer tikka, Chili Paneer, Matar Paneer, Paneer Korma, Aloo Gobi Masala, Chana Masala, Vendakka Mappas, Brinjal Masala, Bhindi Masala, Paneer Butter Masala or Paneer Makhani, Aloo Shimla Mirch Sabzi are all very popular Indian vegetarian dishes. 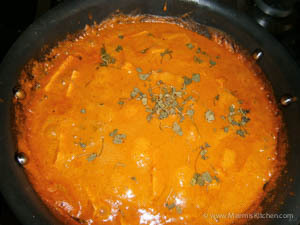 Butter Paneer/ Paneer Butter Masala or Paneer Makhani is everyone’s favorite choice in any restaurant. To be honest, I am still not sure about the difference between Paneer Butter Masala and Paneer Makhani; both tastes almost same, but some say that Makhani does not have onion. Maybe my North Indian friends reading this, can enlighten me on that and clear the confusion. This recipe is simple and tastes awesome like the one you get in restaurants. My kids and hubby say they are way better!! 🙂 The thick creamy smooth gravy, the rich aromatic flavors, spices and the soft velvety Paneer: it is simply irresistible and finger licking good with Whole wheat Naans, Jeera rice or Pulao. 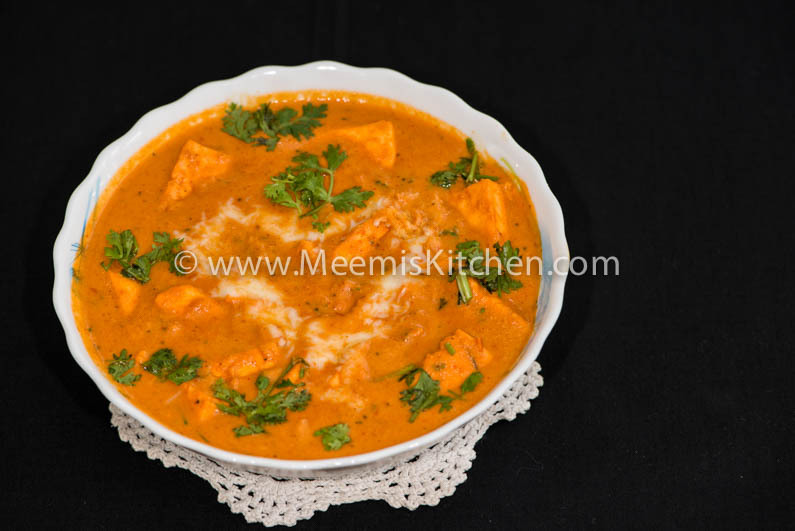 This restaurant style Paneer Butter Masala, is a great dish to impress your guests. Enjoy!! Bay leaf : 1 no. Garlic cloves : 8 – 10 nos. Cut the Paneer into small cubes or triangles. Pour boiling water and keep it covered for some time. Also soak cashew nuts in hot water. Slice the onions, crush ginger and garlic. Heat oil + 1 tbsp butter in a pan. 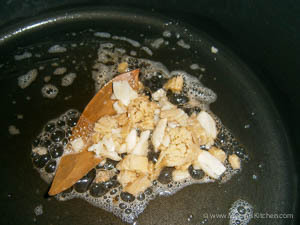 Add bay leaf, then crushed ginger and garlic and fry. Add the sliced onions and sauté till limp. Add the chopped tomatoes and sauté till they are mashed. 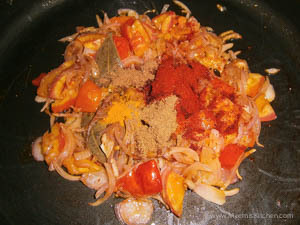 Add the turmeric, chili, jeera and Garam Masala powders and fry for some time. 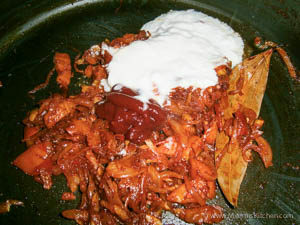 Turn off the heat, add tomato sauce and curd and grind to a fine smooth paste. Heat the remaining butter and pour the ground gravy and sauté. 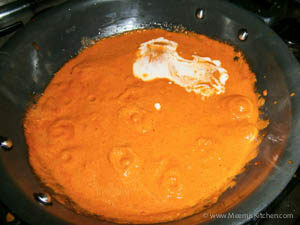 Grind the cashew to a fine smooth paste and add to the gravy. Mix well with enough water and let it simmer. Add drained Paneer pieces and Kasoori methi. Cover and cook Paneer in the gravy for two minutes. Transfer to serving plate and garnish with cream and coriander leaves. Enjoy with Naan or Jeera rice or Pulao! Soak the Paneer pieces in hot water for 5 – 10 minutes to make it soft. After adding the Paneer cook only for few minutes. Please adjust the spices according to your spice level. 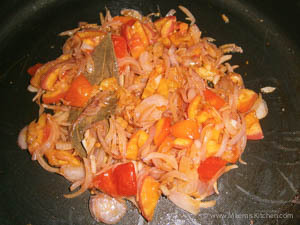 Adding tomato sauce provide enough sweetness to the dish. No need to add extra sugar. You can add cream or grated cheese for garnishing. Cooking with butter gives it authentic traditional taste. Kasoori Methi is available in super markets. It adds flavor and appeal to the dish. If you like this recipe, please share with your friends using the buttons on the side and let me know through comments. That would really encourage me. God Bless! !